This treasured graphic, a gift from my beautiful Angel Family Friend Susan Stoner, Mum to Angel Kurtis Cleaver who shares the same birthdate as Jeremy. I had no idea what it meant! Was I to assume that I was going to live through my breast cancer? That Jeremy had to die to allow me to do that? During the very painful grieving process I developed new ways of learning to live with my grief. I joined a local Bereaved Parents Support Group. At my very first HOPE meeting I was blessed to meet Sharee Carson Wright who told me about the online Memory-of site that she had set up for her beautiful daughter Dixie. I arrived home at 10pm on that night and went online and signed up. I knew nothing about how to put all that information together. 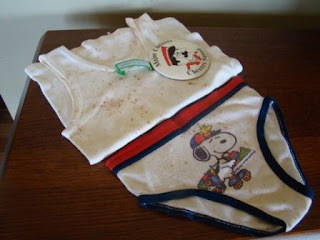 I simply had a burning desire to keep the precious memory of my son alive. Is that not the desire of every bereaved parent? My pictures had all been taken with a 35ml camera. I learned to scan them and save them to the computer, allowing me to display them on the Memory-of site. 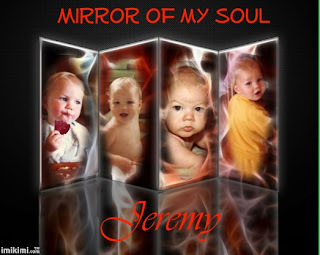 While working on Jeremy's site I decided to check out other sites to see how it was done. I found the most amazing graphics. I asked the question 'How do I do this?' 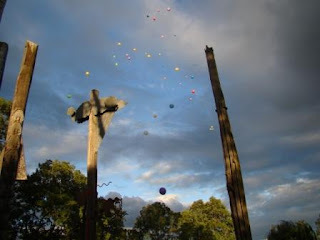 I received an e-mail that led me to Angel Families Online. It was there that I found strength, support and lasting friendships. Over the past 18 months I have given and received many beautiful graphics and verses. There is a constant lighting of candles to keep those Eternal Flames burning brightly. At the time of Jeremy's accident I was in the process of preparing for a new role as a Funeral Celebrant. I had lovingly prepared a portfolio of verse. 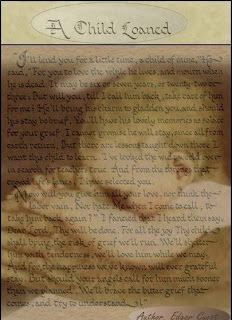 'A Child Loaned' is the one I chose to read at Jeremy's Celebration of Life Service. I have been blessed to become very close and personal friends with Diane Rodgers, Mum to Angel Matthew for this graphic befitting the occasion. 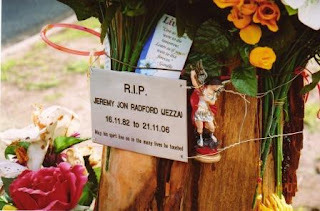 After many months of therapy setting up the Memory-of site I realised that I had always lived my life through Jeremy. Everything I did, I did for him. I had raised him as a single parent following the passing of his beloved Dad. He was telling me that it was time to learn to live for myself. Somehow I had to find the will to fight for myself and my own life. I could not help but think back to the time of my original diagnosis. In 2003, I came home from the doctor with the news that I had been diagnosed with breast cancer. As a 20 year old Jeremy informed me that he would have to leave home. He lovingly reminded me that I did everything for him. He knew that if I learned to do it for myself I would be well. He wanted me to be well! He wanted life for me! Did that surprise me? Actually. No! Jezz was always a very spiritual being and there are many stories reminding me of this fact. He was, and is, protected by his Guardian Angels. What was my reaction when Doctor Fluhrer advised me that my breast cancer is active and the treatment that we have been using to keep it at bay has not worked? I felt at peace with myself in the knowledge that I am surrounded by the loving light of my Guardian Angels. 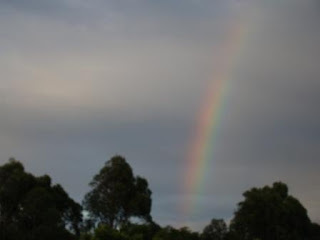 I reflected on the time just over twelve months ago that I awoke from a dream with the knowledge that there was a doctor in Manly that could help me. The only information that I was given was that his name started with the letter 'F'. I knew it was a message from Jeremy and that it was up to me to find the doctor. It took no time before I was making an appointment to see Dr Fluhrer. After twelve months of being guided by him I appreciate the fact that he did not try to tell me what to do at a time that I was not ready. He simply walked beside me on this journey. 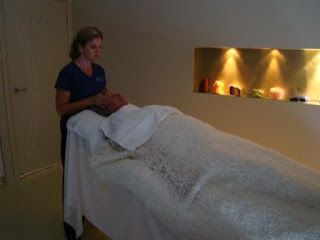 He provided the help to allow me to continue down the path of alternative and complimentary therapies. So what now that he is recommending chemotherapy? I will spend time in contemplative prayer and meditation awaiting insight knowing that everything is just as it is meant to be and all things are possible. I am aware as I write that I like each entry to stand alone. 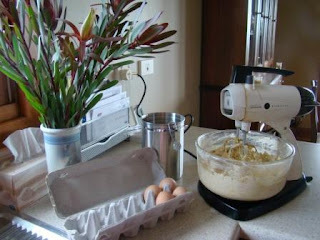 For those that have follwed me from my BigBlog Lessons4Living I do apologise. When I married Haydn in 1996, I believed it was for 'Better or worse, richer or poorer, in sickness or in health'. 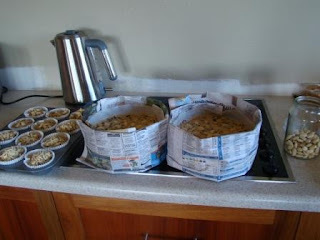 I packed up everything in our family home and put it into cartons to be stored. Unfortunately I realised very quickly that the situation was intolerable for me. More importantly, Haydn was giving Jezz a hard time. Everything Jezz did caused a reaction in Haydn. I knew that I would protect my child at all costs. I think it was about 1998 that I knew, with absolutely certainty, that it was time to leave. We had moved from our family home into Haydn's and the tenants that were renting our Warners Bay home decided that they would like to purchase. Unfortunately, they were unable to get finance. On the Saturday morning that we were making the move back to the house the Real Estate agent brought a prospective purchaser. Eric loved the home and made an immediate offer, leaving Jezz and me with nowhere to call home. I never did get to unpack those cartons. I made the decision to go ahead with the sale as I had no income and needed money for us to live. Being the type of person that gives everything my heart and soul I had given up my studies in welfare, and my Kumon Study Centre, at the time of my marriage. 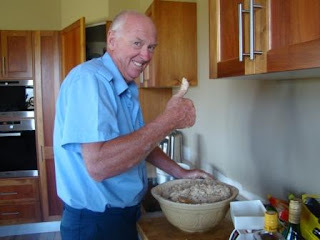 This allowed me more time to give to Haydn and daughter Claire who had been traumatised by the tragic passing of Leigh. For the past 12 years my personal things have been packed away. The things selected and purchased so lovingly in Singapore have not been seen for years. I now realise that they are only material things and have very little place in my life as I follow a new path of healing and wellness. It has been in my 'Personal Posessions' for 26 years. Do I keep it or let it go? I am very mindful of the fact that when I am no longer here, these very things will mean nothing to other family members. I think it best that the memories go on these pages knowing that it is a record for a lifetime. 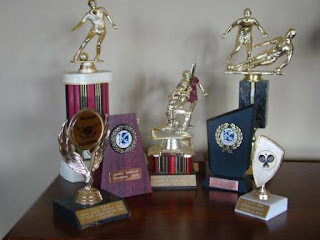 These handful of trophies represent the best of Jeremy's activities during his latter school years; Soccer, Indoor Soccer, Cricket, Air League, and Kumon. Although he loved Karate, I appear to have nothing representing the many hours he spent kicking his way to happiness and good health. I was always amazed that for someone of his size he showed incredible balance as he squatted down, hands on floor and lifted his feet leaving him balancing on his hands. If only I had the digital camera in those days! As I unpacked the box containing these items I knew it was time to let go; they would go in the bin. The memories will remain in my heart and on these pages. No! I did not hit the shops today for the Boxing Day sales. I was not really in that space. Instead I choose to sit quietly and reflect on a course of action given my current circumstances. I was fascinated to find that dozens of little wrens made their way into our garden for the very first time. The striking blue is the male. 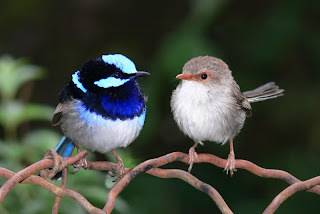 Wrens appear in folklore all aroung the world. I stood by the kitchen window for some time, watching as they darted in and out amongst the shrubs. Knowing that Boxing Day is also know as St Stephen's Day, or Day of the Wren in Ireland, there simply had to be a message for me. 'The Wren heralds the coming of new challenges. It charges us with an unwavering faith in our ability to achieve any goal. Carrying the torch of the East: the beacon of illumination, intuition and the intellect Wren embodies the ability 'to know'. It offers clarity potent enough to shun confusiona and despair forever by acting as the metaphoric light at the end of the tunnel. It maintains mental lucidity and the knowing as to when we should close old doors so that new ones may open'. Christmas '08 brought with many blessings. I have been overwhelmed by the love and friendship that has flowed into my life over the past few days. Some months ago I received a message from Spirit Son Jeremy telling me it was time to get in touch with a school friend Marie. We have managed to catch up only 2 or 3 times in the past 45 years. I telephoned her, promising that I would make the effort to visit as soon as possible knowing that she lives only hours from me. Marie has experienced much pain in her life due to serious degeneration of the spine. Pain is her constant companion! Having recently become the proud owners of their first computer she decided to develop new skills and record a Christmas album using family members. Husband Eric and wife Marie performed in a band and their three children all have natural ability making music their life. I received a copy of the CD in yesterday's mail. The CD 'Christmas Angels' has been produced by Marie herself while the children and grandchildren all performed vocals. I was thrilled to receive a gift that touched me deeply. There is a particular song called 'Christmas Angel' in which Marie has written and performed the words and music. It came as a true gift from heaven! Today we had a lovely day with 'The King's' family and it was with a deep sense of peace that we were heading home when I felt the area of my right breast only to discover that I have another breast lump. As I look back on this day I wonder what will be most lasting memory? Fortunately, I have an appointment with my doctor in Sydney for Tuesday. It was to be about my pain levels. Now! Who knows!! At this time of year I would like to take the opportunity to say a big 'Thank You' and 'Merry Christmas'. May peace and prosperity be yours in 2009. I am extremely grateful for the support and friendships I have discovered within these pages. I cannot believe the change in my energy levels and enthusiasm since beginning my new regime. Although it consists of little more than green beans, zucching and parsley it has been worth the effort. Seeing David on Monday gave me the courage to make the changes. I cannot believe how easily I have managed to discipline myself. Guess I really did reach the 'point of no return.' Pain levels have eased and I feel comfortable going into the Festive Season knowing that I have regained some control of my life. I look forward to continuing the Posts as quickly as possibly knowing that, in some ways, this has become a bit of a 'Life Line' for me. Thanks for sharing the journey. 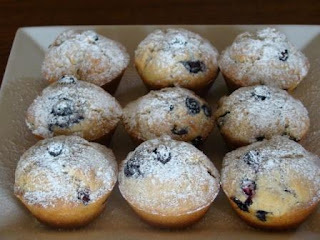 On Saturday I baked Blueberry Muffins to take along to my final Positive Energy Group meeting for 2008. I have been delighted to find, since moving to the farm, that there are many opportunities to be in the company of like minded people. We were each asked what Christmas meant to us. It was easy to see therefor, why the topic chosend for the day was 'Love' As we were asked to bring to mind those people that we felt deserved to receive our love, I became aware that my problem was my inability to love myself. Why did I feel unloveable? As I searched for the answers I realised that, in the past, I had easily been able to love those that I felt had returned my love. I had not been successful in loving unconditionally. Loving my children was easy. I quickly learned to understand that their behavious was not who they were. Knowing that Mum had passed without telling any of her children that she loved them I understand that, in my lifetime, I will not know the reason for this. Thankfully she did not discriminate. It applied to all five of us. It seems that she simply 'shut down' as a 16 year old when her first and only love was sent away to work on the railway. Mum never recovered from the separation of that young love. Having uncovered some things that were very personal, and very close to my heart, I felt that there was definitely a healing taking place. 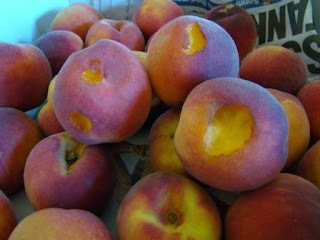 It therefore surprised me immensely to find on my return hom that I was in unbearable pain. Although I have had some problems with phlebitis and bursitis, as well as lymphoedema, this pain was like no other. I was 'pill popping' in an effort to try to get some relief. I knew I ran the risk of taking too many. The pain would not leave me. I was distraught! I decided to e-mail my doctor in Sydney as well as a local Naturopath/Hypnotherapist named David that I had seen approximately 12 months ago. Unfortunately I am paying the price for abusing my body on this grief journey. Drinking far too much coffee, while not eating foods to balance it, has caused an imflammatory response. I have been told that for each year of abuse it will take me one week of a very strict regime to alkalise and bring my body back in to balance. I made contact with one of Jeremy's friends during the week, explaining that I wanted to be the one to tell her that the tree is to come down this week. I then began thinking of a recent phone call from one of Jeremy's mates. He shared with me this story. Each time he drove by the tree, he and his daughter would wind the windows of the vehicle down and punch the air calling 'JEZZA' as they drove past. They had been doing that since the night of the accident. On this occasion he said that he heard Jeremy's voice in his head saying 'Don't do that!' 'I made the biggest mistake in my life and I don't want to be reminded of it!' I was not surprised! Easter was a great excuse to party at Dargo! Easter 2008 saw the party go on without Jezz, although there were many stories shared and raised hands (with glasses) in his memory. Megan was present also. Driving home the next day Jeremy's friend took his eyes off the road; he was sending a text message. Amazingly he heard 'R O D!' He knew that it was Jeremy! He looked up to find that they had veered to the wrong side of the road and were heading towards an approaching vehicle. He was saved from a potentially serious situation! He said he had never experienced anything like this before.I am so grateful that Jezz is still weaving his magic. Last night I attendend our Candle Lighting as part of The Compassionate Friends Worldwide Candle Lighting event. At 7pm, on the second Sunday in December, candles are lit, around the world, making a wave a light as it goes through the different time zones. Truly magical! 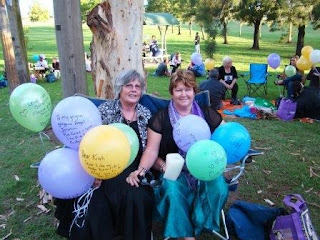 Here I am with my gorgeous friend Sonya (on the right) as we prepare to release our balloons. Unfortunately Jeremy had other ideas. My first one burst - unexpectedly, it was the only one - and the second one had a mind of its own and escaped while I was taking photos. I went with his wishes and did not make another attempt. Up, up and away go the balloons. The highlight of the evening was this magnificent rainbow which appeared. We were elated as it followed a tradition which began last year with our inaugural event. I am not going to save this Post to Draft as I usually do. I have become aware that the colour used in some of my Posts makes them a little hard to read. In my effort to correct the problem, I did some editing and saved them to Draft, only to find that I can no longer Post them. No editing until I sort out the problems. I do apologise for the glitches that I manage to find in the system. I am finding the help I need and feel sure I will work this out. My personal thanks to Mandy and Diane. Stay close. Please! In the meantime, please be patient with me. I am on my L's with all of this. 'The King' tells me constantly that I need help. Maybe he is right! I passed the message on. I felt my heart miss a beat when Mum barely acknowledged Jeremy's love. How could it not be possible to tell your grandson that you love him? The Christmas tree now has butterflies. At a price! Did a spur of the moment thing and decided to order the butterflies online as I spend very little time in the shops these days. 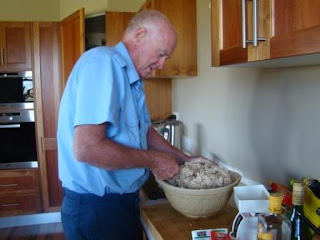 I am quite happy at the farm and thorought enjoy the solitude of rural life. When I was doing my one and only day of Christmas shopping on Tuesday, I noticed feather butterflies in House and Garden. I actually thought they looked a little 'cheap' as there was just a solitary wire that appeared to wrap around the tree branch. You can imagine my surprise, and disappointment, therefore to find that I had ordered exactly the same thing online at four times the price. I have made a definite decision to get back to ceramics and craft class as soon as possible in 2009. I can create my own butterflies knowing that I have many friends that would also appreciate them as gifts. Below is a copy of the e-mail that I have sent off this morning. I think it tells the story. I am delighted to find a company that operates so efficiently. 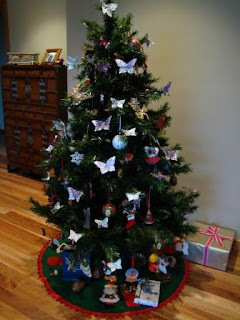 My order arrived safely yesterday; I am thrilled to have so many butterflies adorning my Christmas tree. I am writing to advise that one of my Jeweltone Glitter Butterflies (XATJ12A) arrived with a broken wing. The items were very well packed so I am unsure exactly how this happened. I was also disappointed to find that the Small Silver Glitter Butterflies for which I paid $18.50 are available in House and Garden. Normal price $4.95, currently reduced to $2.99. I had no idea I was purchasing one and the same thing. Although I applaud you, and appreciate the convenience of shopping online, I admit that I did order in haste and have paid the price. Living in a time upon the earth when our awareness is awakening, the tradition of giving gifts at Christmas time is no exception. The giving of Christmas gifts carries commercial pressures, as well as pressure and expectations from family and friends to give in a certain way. For too many of us this is a time that we can easily go unconscious and give into these external pressures. 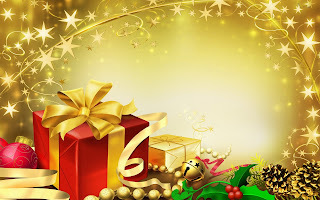 So as you read this message, this may be your opportunity to check inside and give some thoughtful consideration to giving gifts that reach out and really touch someone. This can be as simple as making the gifts yourself and giving gifts that reflect what a person means to you, such as the offering of those three words 'I love you.' There are other gifts that also really make a difference. Gifts such as giving to charities and organisations that meet the needs of those that are challenged with simply giving the gift of life to themselves. Serving others with love and extending ourselves to care for the heart, mind, body and soul of another is the true spirit of Christmas. So, reflecting upon this, what will you give this Christmas? I found yesterday to be emotionally draining. I left home at 7am to arrive at Garden City by 8.30am ready for my one and only day of Christmas shopping. Things were going well! I was in the process of purchasing a new white skirt to wear on Christmas Day. It was 11am when I answered my cell phone. I found myself holding my breath as the voice at the other end said he was Constable ? from Bairnsdale Police. 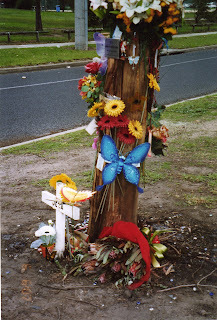 Memories of a phone call with Bairnsdale Police was on Tuesday 21 November 2006 came flooding back. I received a call from my eldest son Damian at 10.06pm informing me that my youngest, and much loved, son Jeremy had been killed in a single vehicle collision in McKean Street. How did Damian, in Melbourne, learn so quickly of the accident that happend 350km away? As Jeremy's only surviving parent it was up to me to make the phone call to the Bairnsdale Police for confirmation. Yesterday the young constable very quickly explained that the Bairnsdale Council wished to speak to me regarding the tree that had been hit by the vehicle Jezz was driving. It is now dead and considered to be a potential hazard. I was given a mobile number for Tim East, and a request to call him. The Christmas spirit dissipated very quickly. I headed back to the factory to make the call. I found Tim to be a delightful human being. He advised that there had been several complaints about the tree becoming a roadside memorial and he had successfully placated those making the complaints. He also added that he could not understand some people's motives, and that, maybe it had something to do with the fact that they had not walked in my shoes. The Council apparently have heart (collectively) and wish to confer with me before any decision is made. They currently have no Policy on Roadside Memorials. I felt a deep sense of gratititude that the matter was being handled with such sensitivity. Tim explained that branches were now beginning to break off and it was becoming dangerous. I could hear Jeremy's voice in my head telling me it was time! Was that time to move on or time to cut down the tree? Tim and I shed a few tears as I thanked him from the bottom of my heart for being so caring and considerate of my thoughts and feelings. I explained how grateful I was and wished him well. I then made a very tearful phone call to my daughter Megan in Lakes Entrance and asked her if she would be able to gather the plaque and personol keepsakes from the tree before it is taken down next week. I have always thought that 'timing is everything.' Why then am I so accepting of the fact that the tree will be removed just one week prior to Christmas? Perhaps Jeremy is saying 'Merry Christmas Mum!' Time to move on..
A quick Post while it is fresh in my mind. I phoned Paul this afternoon, desperate to control the pain in my arm, shoulder and back. The discussion led to how long I had been in pain and what I was taking to control it. When I told him I was taking Nurofen Plus I was told to stop immediately. It contains 200mg of ibuprofen per tablet and comes with an increased risk of bowel cancer. He was insistent that we did not want that! I was told of a patient that had surgery after taking the medication for a period of time and the doctors were unable to close her up due to the increased levels of bacteria. I found the information on the web interesting when I decided to Google!